Aram Khachaturjan's music is unique, vibrant and multi-colored. There are no doubt that the main reasons for this lie in the Armenian homeland of the composer, whose folklore and its history profoundly influenced Chatschaturjan. Chatschaturjan has cultivated, transported and interpreted these influences in many different ways, even though as a young man he was trained in the realm of Russian Modernism. At the age of 19 he had gone to Moscow, actually to study biology. After a few months, however, he began studying cello and composition at the local Gnessin Institute. In 1930 he moved to the Moscow Conservatory, where he studied under Nikolai Mjaskowski (composition) and Sergei Vasilenko (orchestration). In 1951 he was appointed professor of composition at the Moscow Conservatory and in 1957 became secretary of the Composers Union of the Soviet Union. He had also made a name for himself as a conductor many years earlier, and since the mid-1970s he has also performed in this role in the West. An appearance at the NDR in Hamburg was legendary, the recordings are still among the great treasures of the broadcast archive. Shaped by Vasilenko's 'conservative' ambitions, Mjaskovsky's new-minded attitude and the influence of Armenian folklore on his background, Khachaturian succeeded in combining the folk music of his Armenian-Caucasian homeland with Russian art music. Above all, the ballet "Gajaneh" is an expression of his personal, individual creative will. The "Saber Dance" from this work gained worldwide popularity. 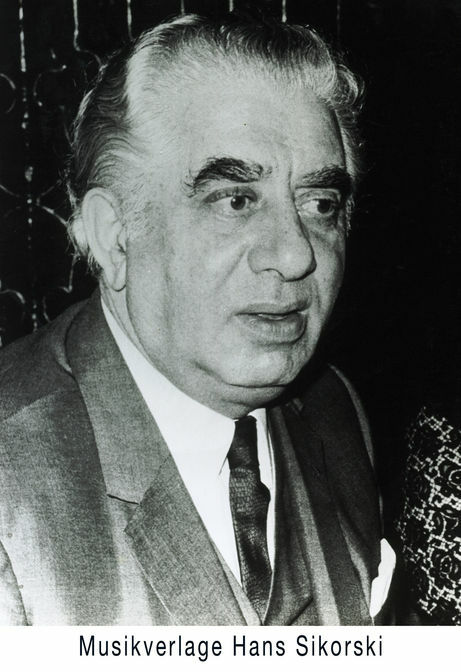 Aram Khachaturian died on May 1, 1978. On May 1, 2018, we commemorate his 40th anniversary. Recently, many, even less known compositions from Khachaturian's vast oeuvre have been rediscovered, performed and newly recorded on CD. Alone 24 volumes comprises the Russian-Soviet edition of Aram Khachaturian's works. Those who research it will find that the much-vaunted folklore pragmatism is barely applicable to all the works of the Armenian and the image of the "Caucasian Grieg" badly overused. The edgy-nervous first movement of the rarely heard violin concerto from 1940 proves this claim and may have inspired the French flutist Jean-Pierre Rampal to transcribe this violin concerto almost fifty years ago, in reality, out of a reluctance to even write a flute concerto Granted in 1968. Especially in the deep situation, this version emphasizes the dazzling color changes of the work, which is constantly pressing forward, even in the oriental-playful Andante sostenuto. Some sharpening in Chatschaturjan's instrumentation, especially the edged blends with tall woodwinds and the rattle of the percussion, are elegantly counteracted. A new edition was published in our catalog, the two-volume children's album for piano by Aram Chatschaturjan. The sequence of well-playable, illustrative piano pieces has long been a classic. The Armenian composer really thought of everything. In the "Pictures of Childhood" (Ed. 2144) he lets the small and large pianists take a walk. There is a musical consolation for the sick Ljado as well as a wild "cavalry". It is equally fun to listen to the "Two babbling aunts" from the "Sounds of Childhood" (Ed. 2166) or to imagine a "leopard on the swing" to which Chatschaturjan dedicates a piano-like portrait. And of course, there are many pieces that are inspired by the folklore of Chatschaturjan's homeland. Above all, the edited edition of the two volumes sets entirely new standards in the score sheet. The staves are clearly arranged on the pages, playing instructions and fingerings have been completely revised and integrated more clearly than before in the musical text. All Russian-language dynamic data contained in the first publication were translated. In addition, the typeface has been adapted to the conditions of balanced articulation. As small genre pieces in concert, in the classroom and as a daily play literature, the "pictures and sounds of childhood" are outstanding. Now the Hungarian trumpet player Gábor Boldoczki has recorded on his current CD "Oriental Trumpet Concerts" on the label Sony the "Little Song" from the "Pictures of Childhood" in a adaptation for trumpet and orchestra by Péter Erdélyi. The new Boldoczki CD also includes the famous trumpet concerto by Alexander Arutjunjan in the adaptation of Timofej Dokschizer. Another discovery is the Three Concert Arias and the Symphony No. 2, which soprano Julia Bauer and the Robert Schumann Philharmonic Chemnitz, under the direction of Frank Beermann, have just recorded for the cpo label. The German premiere of the Three Concert Arias on May 17, 2015 in Chemnitz with the same performers was a special concert event. The aria trio dates from 1946 and is dedicated to Khachaturyan's wife Nina Vladimirovna Makarova. However, the arias were not premiered until 1967.